"The biggest problem with predicting the end of the world is that, if proved right, there can be no basking in glory." If global warming and the meltdown of the economy weren’t enough to frazzle you about the future, maybe the convergence of ancient prophecies with modern climate change models will do the trick. And you can thank cable TV for the heads up. Citing the Mayan calendar, Egyptian hieroglyphs, Nostradamus and quite a few present-day geologists, the History Channel has made a persuasive case of late for an "end times" apocalypse playing out in 2012. In fact, since most climatologists concur that a Great Flood and other extinction events really did transpire after the rise of human civilization, the idea no longer seems like a stretch. And not that any literature professors are lying awake at night worrying, but when Hesiod proclaimed in The Works and Days that the Earth had "gathered over" at least three generations of men prior to his own, he may well have been speaking the literal truth. Even Plato referred to highly advanced civilizations succumbing to planetary doom in his famous Dialogues. In particular, the dean of Greek philosophy alleged that the continent Atlantis disappeared beneath the sea in a geologic catastrophe around 9000 B.C. For people living in Venice, California, Mr. Emmerich's movie was definitely a wake-up call. Percolating much anxiety of late is the 5125-year Mayan "long count" calendar, scheduled to end on December 21, 2012. This intricately calibrated timepiece is thought to constitute a single world age — that is, one of Hesiod's generations of men. Mexican artist and visionary Jose Arguelles first publicized the end date to a mass audience with his 1987 gathering called the Harmonic Convergence. Thousands of erstwhile supporters flocked to sacred sites around the world, including Mt. Shasta in Northern California, where they spent the day meditating for peace and planetary redemption. Arguelles picked the date 8/16/87 because it represented the end of another Mayan cycle, the 462-year period called the Nine Hells. This epoch began with the Spanish conquest in 1519 and ended (by some coincidence) with the Reagan Administration's disastrous proxy war in Central America. Curiously, an unusual astrological alignment of the planets occurred in 1987, which some say contributed to other milestones as well. In June, the enactment of perestroika brought the break-up of the Soviet Union. The demise of apartheid in South Africa followed, along with the reunification of East and West Germany. It seems the cycle of Nine Hells is succeeded by another period in Mayan calendrics called the Thirteen Heavens. While Arguelles' prayer fest failed to stop the siege of global warming, it did spawn a cult-like absorption in archaeoastronomy and ancient history. Like asteroids hurtling towards the Earth, a steady stream of books has been pelting the Barnes and Noble shelves ever since. Among the more notable titles: Zecharia Sitchin's Earth Chronicles series, Graham Hancock’s Fingerprints of the Gods, Robert Temple's The Sirius Mystery (originally published in 1976), John Major Jenkins’ two books, Maya Cosmogenesis 2012 and Galactic Alignment , Technology of the Gods and Lost Cities series by David Hatcher Childress, and Patrick Geryl’s over-the-top yarn, The Orion Prophecy. As unbalanced as this list is gender-wise, it's worth noting that a British woman, Moira Timms, beat out the rest the pack in tying together history, prophecy and science in her 1979 book, The Six O'clock Bus: A Guide to Armageddon & the new Age. (The book was later republished with the title Beyond Prophecies and Predictions.) A decade earlier, some incredible reseach into the Precession of Equinoxes and its role in ancient destruction myths came to light thanks to the late Dr. Hertha von Dechend. The German scholar and history professor co-authored the book Hamlet's Mill, nowadays routinely cited in the archaeoastronomy literature. “The thirteenth baktun will be finished on Four Ahau, the Third of Kankin, it (indecipherable) will happen. (It will be) the descent of the Bolon Yookte’ Ku’h to the (indecipherable) ” For more on Makemson, see Mayan Calendar and Prophecy. In 2006, Daniel Pinchbeck encapsulated various lines of thought circulating up to that time with his counter-culture thriller, 2012: Return of Quetzalcoatl. The Village Voice described the book as a "spiritualist manifesto", its reviewer apparently relieved that someone was finally prodding Generations X and Y to put away the I-pods and cultivate their intuitive powers instead. The following year, Lawrence E. Joseph published his riveting, if sardonic Apocalypse 2012: A Scientific Investigation Into Civilization's End, raising the anxiety level of doomsday trackers even higher. This book offers the best survey to date of potential Armageddon scenarios. Pinchbeck and Jenkins were among the line-up of pseudo-experts featured in the History Channel's wildly popular 2007 documentary 2012: The End of Days. This perpetually airing program combines an invigorating soundtrack with an action-packed rundown of predictions about our coming doom. With the success of that project, History went on to produce a host of compelling documentaries along the same lines, including Nostradamus 2012, Seven Signs of Apocalypse, Secrets of the Seven Seals, The Apocalypse Code (analyzing Isaac Newton's 2060 date) and Extinction 2012 (from the series The Nostradamus Effect). On the science side of the equation, Global Warning, The Crumbling of America, Yellowstone (from the series How the Earth Was Made) and Magnetic Storm (from The Universe) deliver an informative glimpse of how planetary catastrophes might play out in the future. 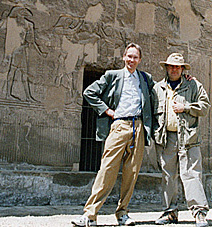 Doomsday detectives Patrick Geryl and Gino Ratinckx on location in Egypt. In 2008, former Hubble Space Telescope investigator Philip Plait tossed a skeptical view into the mix with Death from the Skies! These Are the Ways the World Will End — perhaps a little too cute given the circumstances. Movie director Roland Emmerich joined the fray a year later with his multi-million dollar mother of all disaster films, 2012. Not everyone enjoyed the movie. "The spectacle seemed designed to curtail any deeper thought or discussion of the subject by making it appear ridiculous," Pinchbeck wrote gloomily after it premiered. It probably didn't help that he himself was portrayed as a crackpot visionary by the inimitable Woody Harrelson. Still, those among us not currently up to speed on the doomsday speculation got the official notice. The film's tagline, "We were warned," reverberated out to the four corners of the Earth, courtesy of Sony Pictures' fabulously expensive marketing campaign. Such was the frenzy the scary pitch generated that NASA felt compelled to call a press conference, officially debunking all theories of impending catastrophe, great and small. Spokesman David Morrison's abject dismissal of so much circumstantial evidence was disingenuous, to say the least. Eight months before Emmerich's movie screened, a report from the National Academy of Sciences grimly warned that the Earth might really get whacked hard by a big solar flare during the next peak in the sunspot cycle. NASA funded the study. Even the Pentagon apparently has its doubts about the future. In 2005, it released the less than cheery results of its own inquiry into climate change. Entitled "Imagining the Unthinkable", the speculative study examined the potential fallout from more intense hurricanes, droughts, flooding and famine anticipated for the rest of this century. Nobel Laureate atmospheric scientist James Lovelock kicked in his two cents on the subject with books in 2006 and 2010. He predicts that only 150 million of the planet's population of 6 billion will be left by the time A.D. 2100 rolls around. In the wake of the History Channel's ratings goldmine, both Discovery and National Geographic tossed their hats in the ring with 2012 documentaries airing in 2009, and business network CNBC stepped up in 2011. Perhaps not unexpectedly, the latter outfit honed its sights on doomsday profiteers and fringe elements, like Belgian author Patrick Geryl, who plans to build high-altitude bunkers in Spain and Africa. In Countdown to Armageddon, National Geographic chose as its sole proponent of apocalypse a woman lamely identified as a "Mayan descendant". (Several million Mayans live in the world today, something that outfit whould well know.) However, the program did feature a fascinating chit-chat with noted glaciologist Lonnie Thompson. Thompson has spent years documenting a mass extinction that took place about 5,200 years ago, which gives credence to the notion that an apocalypse happens much more frequently than we thought. As for what those Mayan descendants really have to say about the end of their calendar... unfortunately their religious leaders have remained mostly mum. American archaeologists continue to stick by their story that no evidence supports a Mayan doomsday forecast for 2012. What Anthony Aveni, David Freidel and their peers fail to mention is the four centuries of genocide and cultural annihilation that virtually assured this absence of records and artifacts. Latin American studies professor Robert Sitler points out in a 2007 anthology of articles, The Mystery of 2012 , that the long- count calendar actually dropped out of use long before the Spanish Conquest began. Nonetheless, everyday Mayans he's interviewed believe in a coming apocalypse, one that will be followed by an era of peace and freedom. He also cites a well-known leader among the Lacandon people of Chiapas, Chan K'in, who forecast in 1978, "Our Lord Hachakyum will make everything die... The grass wishes to die. The seed, the animals all wish to die. And the True People also... In thirty years Hachakyum will destroy the world." For its part, in 2010 the History Channel rolled out two new programs, both dramatizations of possible doomsday scenarios. After Armageddon depicts a global flu pandemic in which the necessary vaccine isn't produced in time to circumvent a significant death toll. The ensuing panic triggers a mass exodus of the American population from urban areas. Without doctors and policemen and skilled workers to manage the power plants and other infrastructure, technological society grinds to a halt. "Need to use this story to wake the mass public, before it's really too late. Wish I had 50 or more to use as a tool with people in power etc. As far as an added comment, need a little more emotion put in the last 15 minutes." 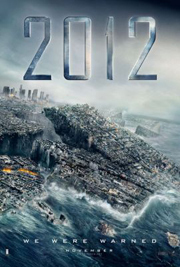 "What is the 2012 Doomsday Prediction?" "Severe Space Weather Events--Understanding Societal and Economic Impacts." (2009) Space Studies Board, National Academy of Sciences. "Imagining the Unthinkable." (PDF). 2004 Study commissioned by the Pentagon. Written by Peter Schwartz and Doug Randall. Compilation of 2012 Articles, Books, DVD's and Websites. Apocalypse 2012: A Scientific Investigation Into Civilization's End (2007) by Lawrence E. Joseph. The Mystery of 2012: Predictions, Prophecies and Possibilities (2008) Various authors. 2012: The Return of Quetzalcoatl (2006) by Daniel Pinchbeck. A Guide to the End of the World (2002) by Bill McGuire. History Channel: 2012 - End of Days (2007), Maya Doomsday (2007), Seven Signs of the Apocalypse (2008), 2012: The Sun (2008), 2012: Ancient Egyptians (2008), Nostradamus 2012 (2008), Secrets of the Seven Seals (2009), Extinction 2012 (2009), The Apocalypse Code (2009) After Armageddon (2010). Countdown to Armageddon (2009) National Geographic Channel. 2012: Science Or Superstition (2008) featuring Graham Hancock and Daniel Pinchbeck. 2012: The Odyssey (2006) featuring Greg Braden, John Major Jenkins and Jose Arguelles.